Our translation and court interpretation services are also available for other European and world languages. 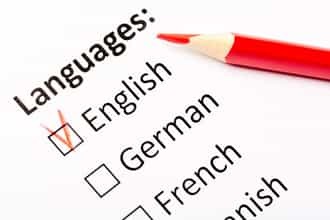 We cover Serbian, English, German, French, Spanish, Italian, Polish, Chinese, and many others. Popović Translation Company takes pride in a highly professional approach to all translation projects, fast and accurate service and competitive prices. As seasoned professionals, we enjoy long-standing cooperation with leading translation companies as well as individuals - interpreters and translators. All you need to do is contact us and we will take care of the rest. The most spoken language in the world is not English but Mandarin, with more than one billion native speakers. This is no surprise as Mandarin is used by the citizens of the most densely populated country in the world - China. English, spoken by more than 500 million people, is the official language in the largest number of countries. Next comes Hindustani. It is spoken by nearly 500 million people and is the main language in India. Hindustani has a number of dialects of which the most famous is Hindi. According to estimates, the Indian population will soon surpass the Chinese. Spanish comes fourth, being spoken in almost all countries of the Latin and Central America, Cuba, and of course, Spain. Russian ranks fifth, being spoken by 280 million people. Russian is one of the six UN languages and is spoken not only in Russia, but also in Ukraine, Belarus, Kazakhstan and even the USA. Arabic comes sixth with 250 million speakers. It is one of the oldest languages in the world. Arabic is spoken in the Middle East, in Saudi Arabia, Iraq, Kuwait, Syria, Egypt, Lebanon and Jordan. Bengali – the official language Bangladesh and several Indian states – ranks seventh worldwide with more than 120 million speakers. Bangladesh is surrounded by India, whose population is growing fast, so the number of its speakers is constantly rising. The eight most spoken language is Portuguese with 191 million speakers and worldwide distribution. As a result of Portugal's early involvement in global exploration, this language is now spoken in Brazil as well, where it is a national language, but also in Angola, Macau, Venezuela and Mozambique. Indonesian comes ninth, being spoken by 160 million people, mostly in Malaysia and Indonesia. Indonesian is the standardized register of Malay as well as the most popular. Rounding up the top 10 is French with 130 million speakers. Aside from France, this language is also spoken in Belgium, Canada, Rwanda, Haiti and Cameroon.